The story of Jesus and the bleeding woman has always intrigued me. At face value, it’s another account of Jesus healing someone from a life-hindering ailment. Which, in itself, is an amazing miracle. It’s crazy how our God can heal. He heals with his words, with his touch, and even from a distance. When people have a healing encounter with Jesus, they are never the same. That’s amazing! But whenever I read this story, something else strikes me as amazing. Jesus restores this woman’s identity. This woman had been bleeding for years. She was probably known as the “unclean one.” The woman was avoided on the street by others out of a fear of becoming unclean themselves. She wasn’t able to have normal relationship with people or God because of her condition. And when she touches Jesus’ coat, that all changes. When she touched him, Jesus knew the healing took place, but he took the opportunity to take this healing one step further. He called her out in the middle of a large crowd and declared her healed. She was publicly declared clean. And this woman, who’s entire identity in life was probably “the unclean one,” was given a new name for all to hear. Daughter. Clean. When we encounter Jesus, when we allow him to transform our hearts and minds into his likeness, we are given a new identity. We are no longer defined by our past mistakes, failures, and short-comings. We are no longer defined by what we do or how we look. We are defined by Christ. Because of his love for us, we are called his sons and daughters. Amazing. Check out the healing story – Mark 5:24-34. This entry was posted in God and tagged healing, identity on March 14, 2015 by tgardner7. Wait, we live on the EAST COAST?! I have always strived to prioritize my life in this way: (1) God, (2) family, (3) ministry. Based on these priorities, my wife and I have longed to be closer to family. And for this reason, we began looking at the possibility of moving away from Coeur d’Alene and closer to family, which currently reside in New York and California (the two extremes!). Once we began looking, God made it quite clear that He was moving us on. Doors opened, conversations happened, and the house sold. Fast. In fact, we had two offers on the table almost before the “For Sale” sign went up. So now I’m one week away from starting as the High School Pastor at Faith Church in Allentown, Pennsylvania, a short drive from Emily’s parents in Burlington Flats, New York. This past month has been crazy. Like I said, the house sold faster than anyone (other than God) could have imagined. We also sold a car and appliances like they were the last on earth. At the end of this week, we’re going to move into a beautiful townhouse in a great neighborhood. And I doubted God every step of the way. Apparently, I have a memory problem. I know God is faithful. He has always been faithful, and I trust that He will continue to be faithful. And yet, my anxiety and fearfulness of the unknown creeps in, probably thanks to the fact that I am human, and I worry about what’s going to happen. ME: What if we can’t sell the house? We can’t afford a rent and a mortgage at the same time! ME: What if we don’t break even with the house? We don’t have money to pay the bank! ME: Ok, the house sold. But what if the inspection doesn’t pass? This is an old house! GOD: Be still and know that I am God. ME: Ok, the inspection passed, but there’s still a lot that can go wrong! Ahhh!!! GOD: I work all things together for your good according to My purpose. ME: What if what You see as good doesn’t match up with what I see as good? Why do we do that? Why do we constantly forget that God is good and He works ALL things together for good according to His purpose. If I’ve learned anything from this adventure called following Jesus, I have learned this: God is faithful, and I mess up. God is perfect, and I have flaws. God is good, and I need to remember to rest in His grace. This new adventure is exciting and scary. And I am so glad that I get to follow my Savior through it all! This entry was posted in Family, God, Ministry on November 24, 2014 by tgardner7. This word can invoke two powerful emotions in people. Change can lead to excitement, positivity, and a renewed passion for what’s coming up. Change can also lead to fear, resistance, and a sense of being out of control. And as leaders, we have the power control which of these reactions the majority of our followers feel. It’s hopefully a leader’s goal to seek a positive reaction to change. The question is, if a leader can control the majority of people’s reactions to change, how do we lead change well? First, we have to understand why people resist change. Church leaders often joke that if change is coming, people will fight, and that’s just the way it is. No effort is given to figuring out why change is so uncomfortable. But if we are going to lead change well, figuring out the truth behind why change hurts is crucial. I love the resources that have come out of the partnership between the Fuller Youth Institute and Fuller Seminary leadership professor Scott Cormode, specifically the Fuller Youth Institute’s Sticky Faith Launch Kit. In it, they guide churches through a process of leading change. From their expertise in the field of leadership and change, they have found that “fear isn’t primarily about change; it’s about loss” (Launch Kit, page 33) So often, we try to navigate change out of the felt reality that people’s resistance to and fear of change comes from the change itself. However, people’s resistance to change actually comes from a resistance to loss. 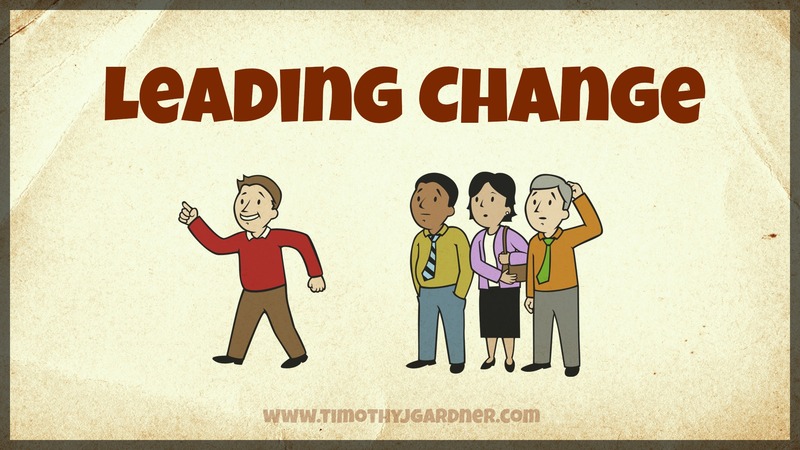 CHANGE: When I “canceled” high school Sunday school, parents resisted the change, not because it was simply a change, but because they felt a loss associated with their children’s spiritual development. So if fear of change is from a sense of loss, it’s important that a leader is able to “anticipate the losses involved and prepare a response” (Launch Kit, page 34). There are two main components to this task: (1) listen to those you lead and anticipate their felt loss, and (2) cast a vision for what is possible. If leadership can cast a picture of the future that is clear and compelling, followers will gladly weather change to reach that future. It means calling out the losses and sharing why you think the future goal is worth experiencing this loss. VISION: We see students leaving the church and their faith after high school, and we’re not okay with that. One of the biggest factors that develops a faith that sticks after high school is intergenerational experience. So in order to see our students grab onto the hope found in Jesus, we are integrating them into the life and ministry of the church. For this reason, we’re taking our Sunday school model and integrating it with our adult Bible studies. We’re welcoming our high school students to worship, learn, and serve alongside multiple generations each Sunday morning and throughout the week, resulting in a greater chance for our students to develop a faith that sticks. 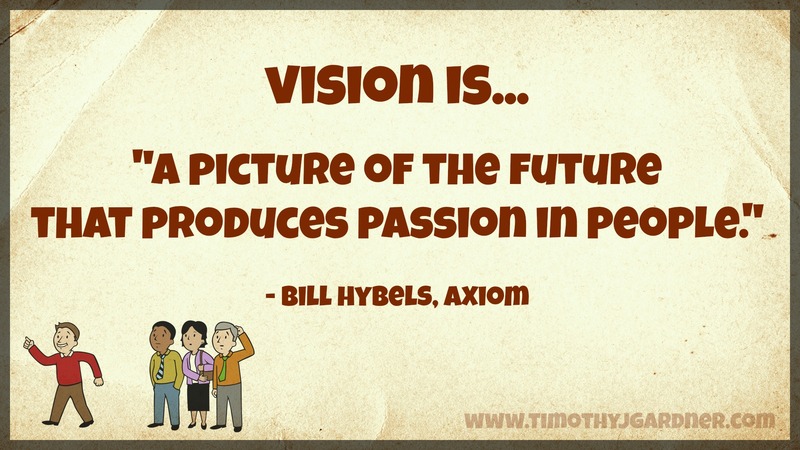 If the vision is clear enough and communicated properly, passion will keep people on board. This is a daily task of leadership. I know I haven’t mastered the art of casting vision or leading change, so I’d love your feedback! What do you do to lead change well? This entry was posted in Leadership, Ministry and tagged Change, Communication, loss, vision on October 8, 2014 by tgardner7. I’ve got something to prove. In the world of church-work, I’m new at this and I need to make a splash. I need to be noticed. Therefore, the more I do, the more I can produce; and the more I produce, the better I will seem to those around me. There’s a lot wrong with the opening paragraph. I hope that’s painfully obvious. Unfortunately, this is an often unspoken reality in the lives of youth workers. We are often seen at the bottom of the totem pole of church hierarchy, “serving our time” as youth pastors before we can graduate to a more glamorous, higher paying senior pastor position (check out this blog post by Amy Jacober on this very topic!). Even if you’re not in youth ministry as a stepping stone (and I pray most youth pastors today are not), this mentality brings with it the often subconscious thought that we have to prove ourselves worthy of our calling. I’ve been guilty of this, and I’ve seen people guilty of this. So what do we do? 1. The less you do, the more you accomplish. 2. 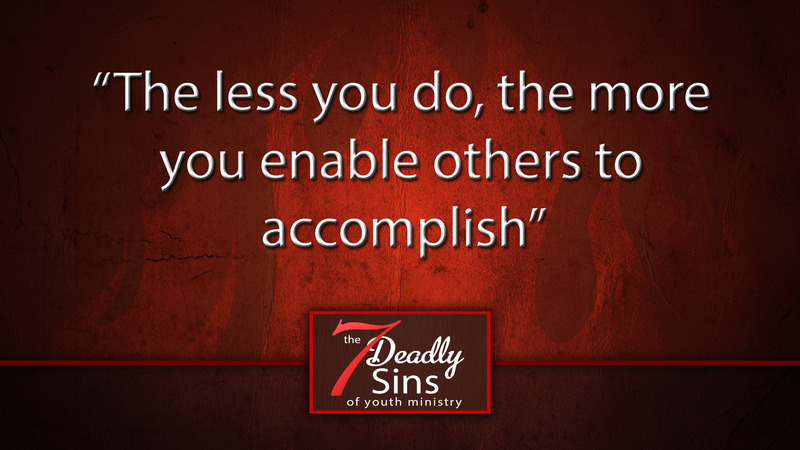 The less you do, the more you enable others to accomplish. If we try to do it all, our underlying goal is to please people instead of God. In trying to do it all, we take on roles that don’t necessarily maximize our gifts and calling when we could be delegating to others and thereby helping them fully live out their own calling. Not only have we hindered ourself, we’ve hindered others. If we acknowledge that we’re not Jesus, release control, and involve others in the mission of seeing youth experience the life-transforming power of God, we accomplish more. Live out your calling, accomplish great things, and don’t do it all. 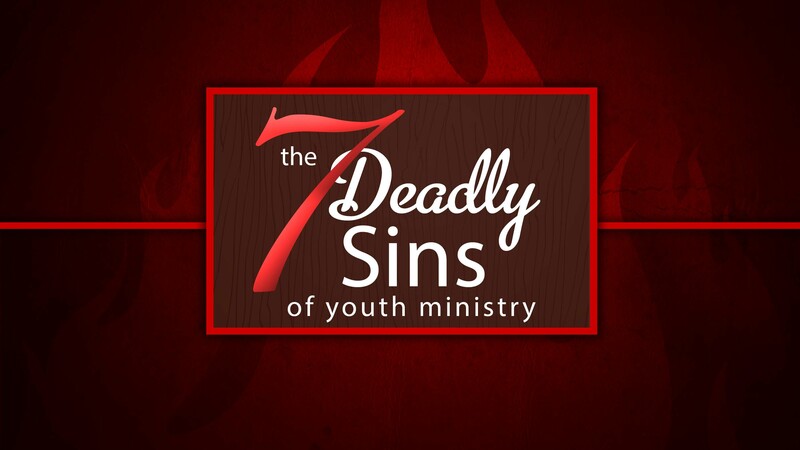 This entry was posted in 7 Deadly Sins, Ministry and tagged Deadly, Sin on September 18, 2014 by tgardner7. 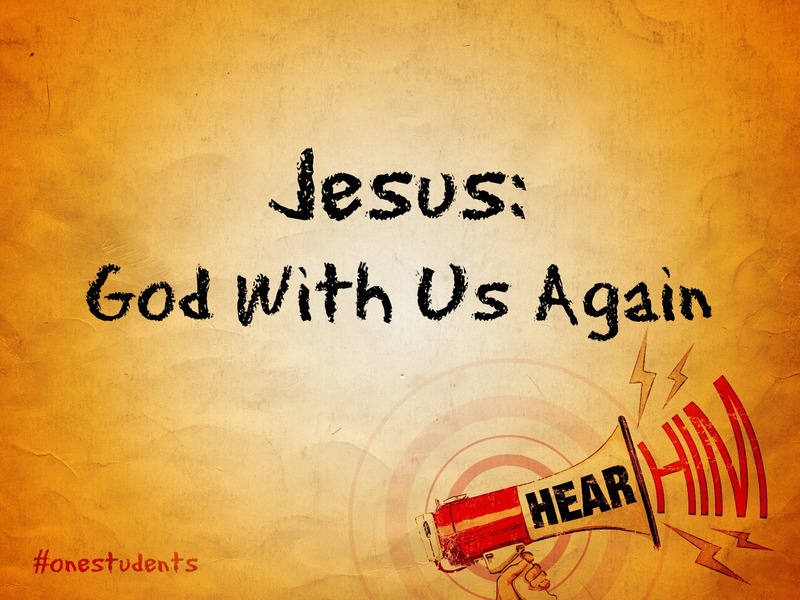 hear him: where is god? You forgot to do your homework. That worksheet you needed to do for english class is blank because when you got it the day before, you placed in the middle of the book. Because it was out of sight, you totally forgot about it until you got to class today. Now you’re frantically trying to finish it before the teacher needs to collect it. It wasn’t in front of you, you didn’t notice it, so you forgot it was there. Just like forgetting about your homework, it’s easy to go through life and live in the moment, not remembering God or paying any attention to his presence. Because how are we supposed to notice God’s presence, anyway? If God isn’t actively speaking to us throughout our day, it’s easy to forget that he’s there. Let’s start at the beginning… God creates the heavens and the earth. He creates all things, plants, animals, light, dark, and everything else. And then God places man and woman in a special place, a garden. And God, man, and woman lived together in perfect community in that garden. They hung out, played games, laughed together. It was perfect! And then sin entered the picture. 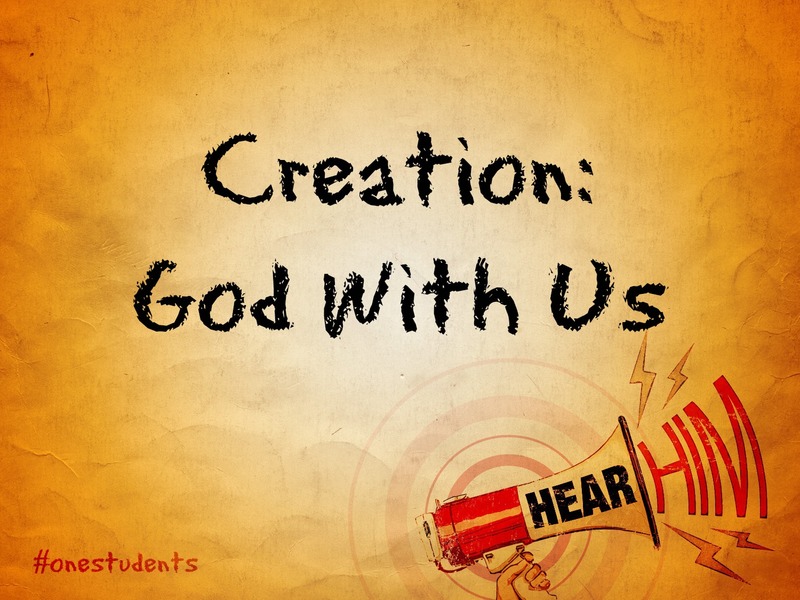 “Where are you?” — For the first time in all of creation, God felt a separation between himself and his creation. And because of sin, humans could no longer be in a right relationship, in perfect community with God. And the entirety of the Old Testament is humans trying to regain a right relationship with God. But then Jesus enters the scene. God in human form lived in community with humans for the first time since the beginning. We walked, talked, and cried with the people he was with. And he loved them more than they could know. But Jesus couldn’t say around forever, but there was a plan. This is called God’s OMNIPRESENCE— God is everywhere. That means that no matter where we find ourselves or how difficult our circumstances, we can be certain that we are never alone. If God is simply a cosmic ruler who doesn’t have time for us, not really caring who we are or what we do, who isn’t present in our lives, I don’t believe he would have gone through the physical and emotional pain of sending Jesus to the cross. It wouldn’t make any sense. His sacrifice would be for nothing. God is present and wants to have a conversation with us. But in order to have a conversational relationship with God, where we can talk to God and we know how God talks to us, we have to understand God’s presence. God. Is. Present. And he’s ready to have a conversation with you. This entry was posted in God, Hear Him and tagged Conversational Relationship on September 11, 2014 by tgardner7. In 1 Kings, which is a book in the Old Testament, just after 1 and 2 Samuel, we find the story of a prophet, a messenger from God, named Elijah. Elijah is this guy who was called by God to do amazing things. One day, he challenged false prophets to a showdown on Mount Carmel. You may have heard this story: the false prophets sacrificed a bull and tried to get their God Baal to light the altar on fire, but nothing happened. Elijah rebuilt the altar, sacrificed a bull, and poured water all over it. It was soaked. And when Elijah called on God, fire fell from heaven, consuming everything on and around the altar. And then Elijah had all 850 false prophets killed. Word got back to someone who followed one of the false gods, and she sent Elijah a death threat. So Elijah ran for his life. He ran for 40 days until he reached Horeb, which was known as the mountain of God, where God dwells. Like God doesn’t know what Elijah was doing there…? I think it’s cool that when we approach God in prayer, he doesn’t stop us from sharing what’s on our heart since he knows already. He welcomes us to pour out our hearts to him, and he loves it when we invite him in to our lives that way. Did you catch what Elijah is saying here? I have been zealous (or passionate, devoted) to you, God. But look at the rest of Israel… yeah, they rejected your covenant, they messed up, and I’m the only one left who loves you. In fact, everyone is trying to kill me. What am I supposed to do?! Elijah had been a hard working prophet, dedicated to God and God’s people. But now Elijah has had enough. It seems as though everyone now hates him and wants to kill him. And he comes to God for help, not knowing what to do. He wants to hear God’s voice and receive guidance. Ok, weird sentence. God says, go stand on the mountain in the presence of God, because God is going to pass by…? Whether or not it made sense to him, Elijah went. It’s interesting that God wasn’t in the strong wind, earthquake or fire. He wasn’t in the things that Elijah probably expected God to be in. Elijah had just poured his heart out to God — and he wanted God to take action! To defeat Israel and all of her wickedness with the force of a strong wind, the devastation of a powerful earthquake or fire. But God’s presence was actually in the gentle, refreshing, life-giving breeze. I wonder if God was trying to tell Elijah something — that he was not interested in destroying Israel, but of being gentle with grace and compassion. Elijah obviously doesn’t get it, because he says the EXACT same thing as before: I’ve been good, they’ve been bad, what are you going to do?! It’s only after Elijah spends time in the presence of God that God gives him an answer. Elijah needed to experience God’s presence and spend time getting to know his character before God was willing to give Elijah an answer. We have to develop a conversational relationship with God, where we can talk to God and know how God is talking to us. And this begins with spending time with God, getting to know his character, and understanding his presence in our lives. 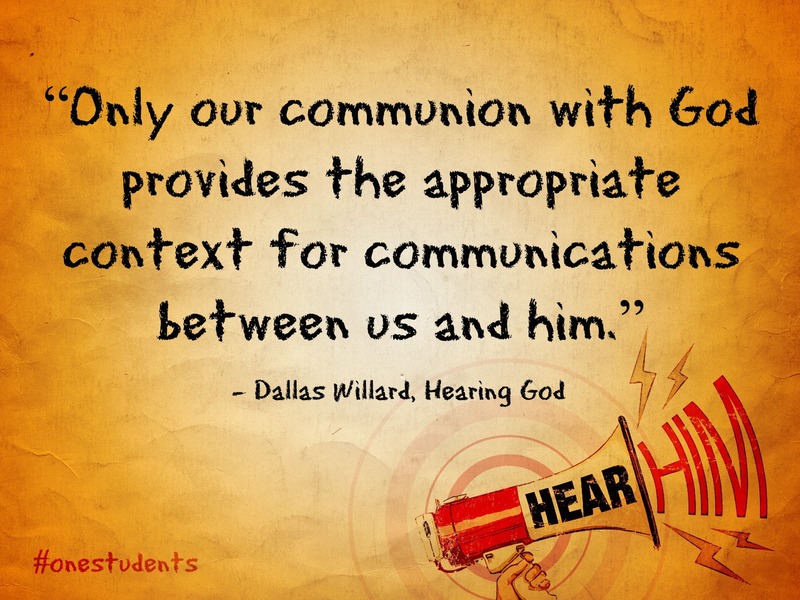 Why do you think it’s important to develop a conversational relationship with God? What does a conversational relationship with God look like in our daily lives? How are we going to spend time getting to know God this week? 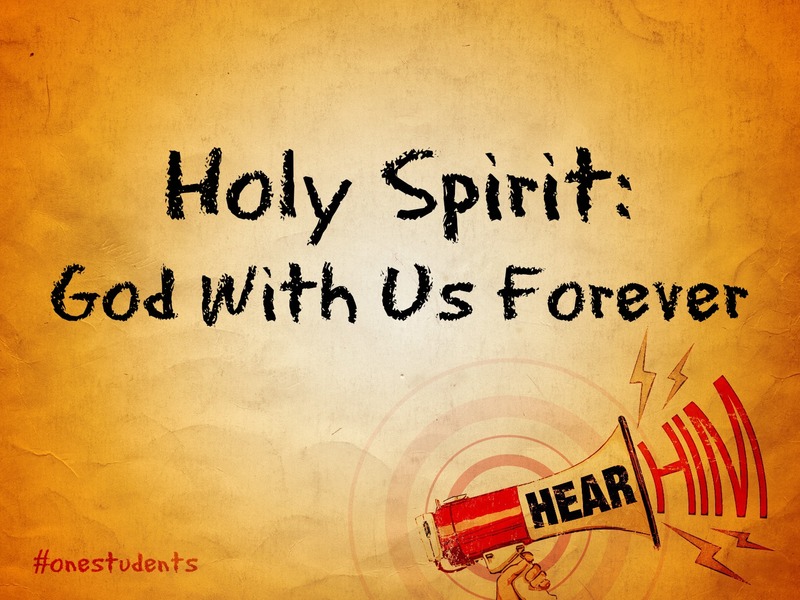 All things considered, do you want to hear God’s voice? Why or why not? Bold text is taken from 1 Kings 19:9-18 (NIV). This entry was posted in God, Hear Him and tagged Elijah, Voice on September 2, 2014 by tgardner7. 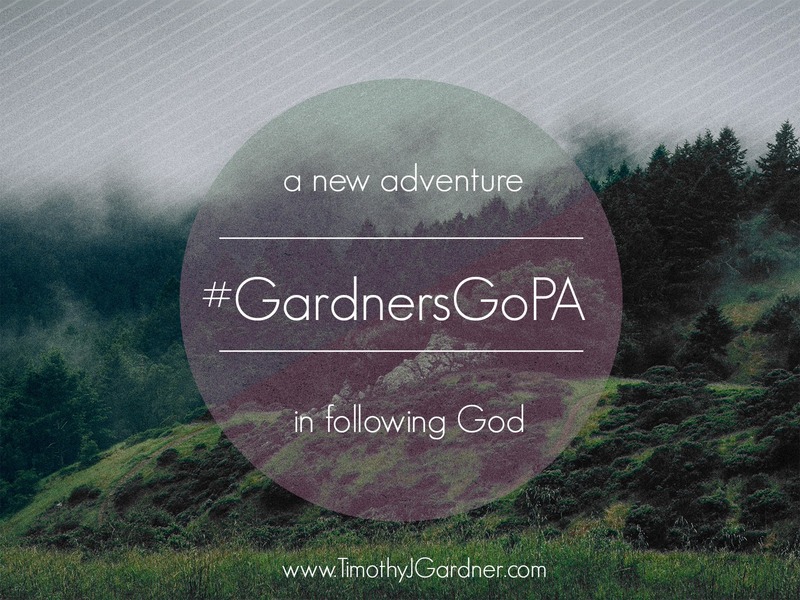 September Series – Hear Him from Tim Gardner on Vimeo. If this topic interests you, check out these good books: Hearing God by Dallas Willard and The Power of a Whisper by Bill Hybels. 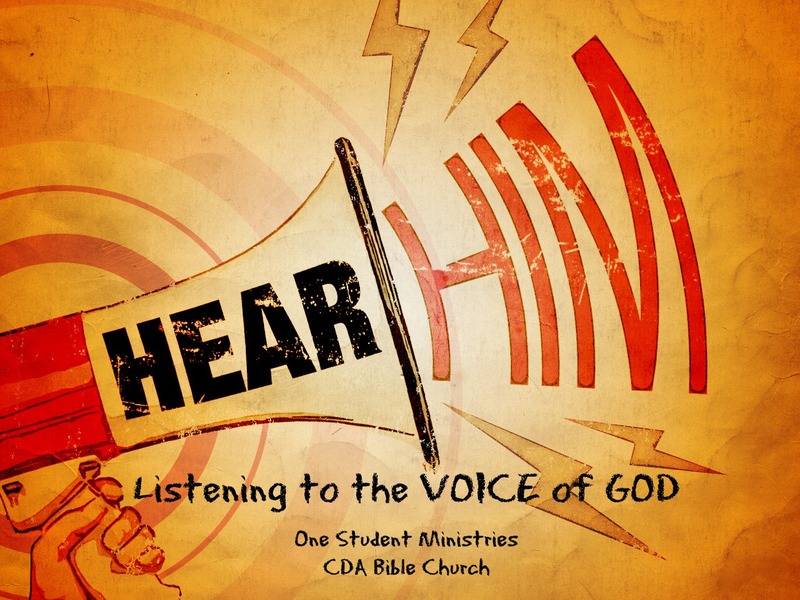 This entry was posted in God, Hear Him and tagged #hearhim, Message Series, Youth Group on September 1, 2014 by tgardner7. HI! I’M TIM. WELCOME TO MY BLOG. I have a hard time understanding this. God loves us intentionally. I get that. He made grand gestures to show us just that. I get that. But giving us His Son? I don’t get that. I love both my kids beyond what I thought possible. Can you imagine giving up something you really, really love . . . on purpose? That’s exactly the way God chose to show His unconditional love for His people! By giving up something incredibly valuable—for YOU. And it doesn’t stop there. He doesn’t just want to show His love; He wants you to live the best life possible by choosing to accept the gift of His love and follow Him. . . “For this is how God loved the world: He gave his one and only son, so that everyone who believes in him will not perish but have eternal life” (John 3:16). ⠀⠀⠀⠀⠀⠀⠀⠀⠀ Today, remind yourself of God’s love for you by writing this verse down and sticking it somewhere you’ll see it this week. And give @hepburnphotos a follow. My sis did a great job with this photo! On the day of Jesus’ death, He went through excruciating pain. He was humiliated, abused, insulted, and put through agony. Why? 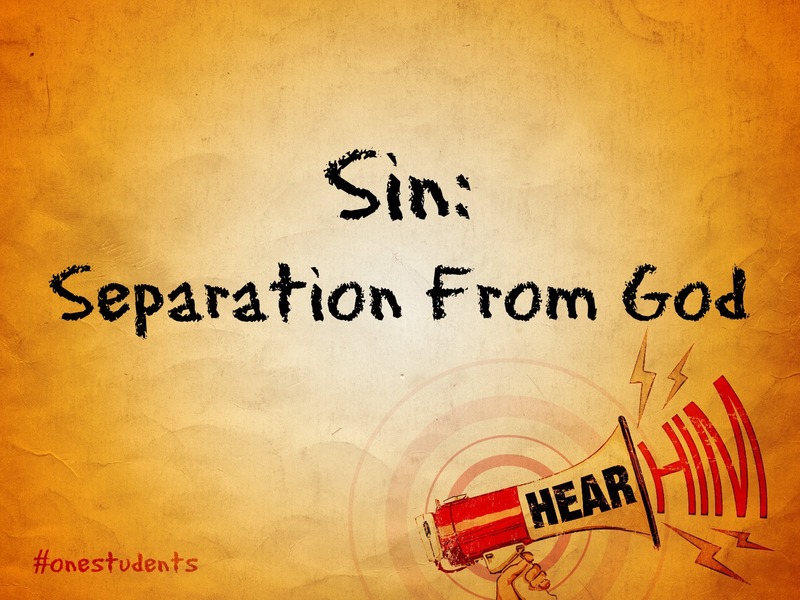 To take care of our sins once and for all and to bring God’s presence to us through Jesus. ⠀ ⠀⠀⠀⠀⠀⠀⠀⠀⠀ ⠀⠀⠀⠀⠀⠀⠀⠀ Jesus knew the mistakes we’d make, and he chose to take on the weight of them on our behalf. He also knew the tough seasons we’d face in life, and he chose to provide us with God’s presence and kingdom in the middle of life’s chaos. ⠀⠀⠀⠀⠀⠀⠀⠀⠀ ⠀⠀⠀⠀⠀⠀⠀⠀⠀ If you’re going through a difficult season right now, remember what Jesus has done for you. Make sure you #lovewhereyoulive by exploring local sights and places. Today, our family explored #TrexlerNaturePreserve and found spring! Don’t just believe in the hill, climb the hill. The Hebrew word for “faith” is 'Emunah' which literally means "to take firm action.” So to have faith is to act. It’s kind of like this hill. It’s one thing to believe the hill exists. But what you DO is more important than what you KNOW. In James 2:17, James explains that works are not the basis for salvation but the necessary *result* of salvation. . . What do you need to do today to see your faith defined by what you do instead of what you know? This is my personal blog and does not necessarily represent the views of Faith Church or any groups mentioned here.